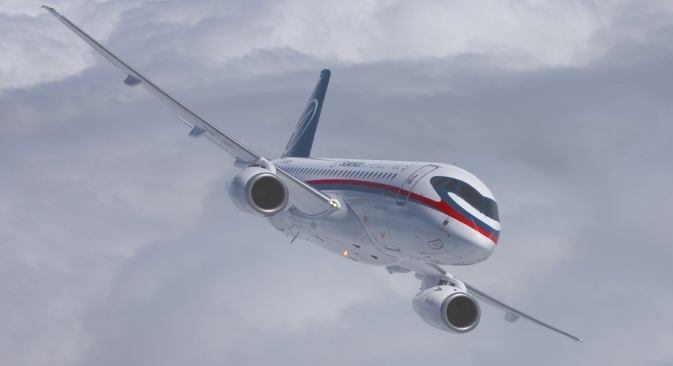 The new Russian civilian airliner Sukhoi Superjet 100 (SSJ). US and European aviation companies are likely to face major competition in India as Russia has proposed to set up a production line for India’s civil aviation sector. A Russian delegation headed by Alexander Potapov, Deputy Minister of Industry & Trade of the Russian Federation, put forward this proposal before Indian officials of the Department of Industrial Policy and Promotion in New Delhi. Keeping in mind the growth of the air traffic, Boeing, the US-based aircraft manufacturer, projects a demand for 1,850 new aircraft in India over the next 20 years. Value of this demand will be approximately worth USD 265 billion. However, Ministry of Commerce & Industry itself projected a demand of 800 aircrafts by year 2020.